The Axces 3 is Arai’s New Entry level full face helmet using the same super fibre shell as the Chaser-V, you get Arai level safety at a lower spec price point. 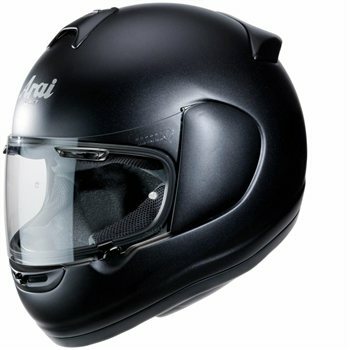 The New shell is based on that of the Outgoing Mid-Range Chaser-V Model which includes the reinforced PB belt that the Chaser-V Shell came with a specially lightened and strengthened area running from the top of the eye port around the helmet to strengthen the helmet and reduce the need for a hard thick shock absorbing lining around the top of the eye port to help improve vertical visibility and strength this helps prevent or minimize concussion as a softer lining can be used. Other design features that contribute to safety include a nice wide visor aperture for improved peripheral vision, double-d ring fastener, plus Arai’s R75 helmet shape a rounder-shaped helmet that give’s better ‘glance-off’ performance in the case you have an accident and hit the ground, designed to help dissipate the energy of an impact and not to catch or dig in which some helmet shapes can do. The Axces III now features a quick-change SAI Max Vision visor the same visor used on the range topping RX-7GP it’s also anti-fog Pinlock ready. One of the Arai Chaser-V’s strong points was excellent ventilation since the Axces III is based on the Chaser-V you can expect the ventilation to be excellent on this motorcycle helmet consisting of a 6-hole top ventilation system. The new shutter system means you can adapt the airflow inside the helmet to reduce wind noise. Thanks to the low profile vents, aerodynamics are enhanced. The interior is the same as the Axces II you can customize the cheek pads for an improved fit. The crown liner and cheek pads are washable which helps the helmet to have a long life. The cheek pads feature communication system speaker pockets for easy integration of an intercom that doesn't compromise comfort. As with all Arai motorcycle helmets, there's a five year warranty.